Applicants notified if selected for funding. Move forward with contracting, dependent upon receipt of EPA grant funding to North Carolina. Through the Section 205(j) Grant program, the U.S. Environmental Protection Agency provides states with funding to do water quality planning. North Carolina typically receives around $100,000 for competetive funding of water quality planning projects. These projects can involve identifying the nature, extent and cause of water quality problems or doing planning work to address those problems. Projects can include, but are not limited to the development of EPA 9-Element Watershed Restoration Plans for a 12-digit or smaller USGS HUC, mapping stormwater infrastructure, conducting engineering designs for stormwater best management practices, and watershed assessments of pollutant sources. Stormwater runoff stemming from increased development has negatively impacted the watersheds surrounding the Town of Beaufort. The Eastern Carolina Council will work with the North Carolina Coastal Federation to develop a plan to restore water quality in these watersheds by restoring natural runoff volumes. The Town of Beaufort has formed a Stormwater Advisory Committee, showcasing its commitment to implementing the plan once developed. High Country Council of Governments will partner with the New River Conservancy to write a 9-Element Watershed Restoration Plan for the East Fork of the South Fork New River. Stressors to this waterbody include historic channel alterations and straightening, lack of riparian buffers and agricultural impacts. Partnerships with Watauga County, the Town of Boone, NC DOT, and Watauga County Soil and Water Conservation Districts will lay the groundwork for plan implementation in future. This watershed restoration plan will complement High Country COG’s stormwater mapping work in nearby towns and New River Conservancy’s regional restoration and watershed planning work. Triangle J Council of Governments will partner with the City of Fayetteville, Sustainable Sandhills, American Rivers, and others to use existing planning documents to develop a 9-Element watershed restoration plan for the Cross Creek watershed. Eastern Carolina Council (ECC) will partner with the Town of Newport in Carteret County along the Newport River to map the Town’s existing stormwater infrastructure (culverts, pipes, outfalls, area drains, catch basins, dry ponds, wet ponds, and ditches.) ECC will also conduct outreach events on how to properly maintain this stormwater infrastructure. This project will help improve stormwater management for the purposes of flood control and water quality, as well as generate responsibility among the Town’s residents in maintaining the Town’s stormwater infrastructure. The Mid-East Commission, in partnership with Sound Rivers, will conduct stormwater assessments and BMP recommendations for 4 school campuses in the Tar-Pamlico and Neuse River basins. Campuses include Pitt County Community College, Beaufort County Community College, Washington High School, and P.S. Jones Middle School. Sound Rivers will develop a ranking matrix to suggest the order of BMP implementation for future work. Additionally, an educational workshop will be convened in Greenville, NC for educational opportunities of local planners, municipality staff, and private consultants. Topics will include minimum design criteria and innovative stormwater best management practices. The PTRC proposes to put together a Regional Climate Resiliency Toolkit identifying strategies communities can take to minimize the impact changing weather patterns will have on water quality and ecosystems in the region. This project will gather climate related data and map vulnerable areas in the region; facilitate four “Working Summits”; 1) Water Supply & Wastewater Capacity; 2) Stormwater & Flooding; 3) Drought & 4) Agriculture; and develop and promote toolkit of best management practices. The project will provide GIS analyses and draft policy language options to promote water quality protection and help integrate it with other goals held by the Town of Siler City, such as economic development, parks & greenways, and connectivity as well as existing ordinances. This project will build on existing efforts and will support the Town of Siler City with technical background and policy tools for how it can protect water quality as it grows. This project involves mapping existing stormwater infrastructure for two Towns in the High Country region – the Town of Banner Elk and the Town of Blowing Rock. Stormwater mapping help protect water quality by giving the Towns the information they need to implement appropriate BMPs, develop appropriate regulations, develop CIPs for stormwater infrastructure, and prioritize maintenance. Managing stormwater as Banner Elk and Blowing Rock develop is important because both Towns are situated at the headwaters of their respective basins and have relatively high surface water quality. McGalliard Creek has been on the 303d list of impaired waters since 2003 and received a poor rating for fish community. This project will involve developing a plan specifically for McGalliard Creek, to help mitigate the creek's water quality issues. The McGalliard Creek Plan will identify sources of impairment through data and stakeholder meetings; outline strategies to aid in watershed restoration; identify restoration activities and best management practices that best address the issues; and compile a project atlas of identifiable properties that best meet the goals of the project. The purpose of this project is to train local stewards to develop watershed restoration plans across North Carolina and increase their capacity to lead local watershed efforts. This will be accomplished through a series of two-day workshops through the NC Watershed Stewardship Network (WSN), of which TJCOG is a founding member. These local watershed workshops will be conducted in collaboration with UNC Institute for the Environment (UNC-IE) and hte Water Resources Research Institute (WRRI). ECC proposes to partner with the Town of Wallace, located in Duplin County in the Lower Rockfish Creek sub-watershed of the Cape Fear River Basin, to map the Town’s existing stormwater infrastructure, evaluate the Town’s existing stormwater ordinances, and educate citizens of the Town on the importance of reducing stormwater pollution. The goals of this project are: 1) to help the Town better manage stormwater runoff for flood control, sediment and erosion control, and water quality, 2) to help improve and maintain water quality in the Boney Mill Pond and Little Rockfish Creek, and 3) to educate the public on how they can mitigate the impacts of stormwater runoff on water quality. This project will involve holding two events to educate elected officials, leaders and other public and private stakeholders in the mid North Carolina portion of the Roanoke River Basin to help improve and sustainably manage the basin. Specific focus will be placed on the Smith Creek, Newman's Creek and Roanoke Rapids areas. UCPCOG will partner with Kerr-Tar Regional Council of Governments and others to hold these professionally facilitated group/stakeholder engagement and input activities. Stakeholder knowledge will lead to increased buy-in and partnership and ultimately lead to actions to improved impaired local waterways. The development of a watershed plan for the Upper Swannanoa River Watershed will address water quality impairments in the Upper Swannanoa River, including the 7-mile section that runs through the Town of Black Mountain, which is on the EPA's 303(d) list of impaired waters. The plan will provide for extensive public education and outreach about the importance of water quality and will lay the groundwork for the town to begin installing BMPs that will result in a significant improvement in water quality. The project involves mapping the Town of Wilkesboro’s stormwater system and gathering detailed information for each stormwater feature within town limits across public and private property. Stormwater mapping will give the Town accurate information to implement appropriate BMPs, develop appropriate regulations, develop CIPs for stormwater infrastructure, and prioritize maintenance. The Town’s request to High Country COG to map the stormwater system was intended to assist with fulfilling commitments to NCDENR in anticipation of possible future Phase II Stormwater Regulations. This project will build upon the Town’s “Cub Creek Watershed Plan,” completed by AECOM in 2009, and the current “Cub Creek Streambed Restoration Project” with Blue Ridge Environmental Consultants. Triangle J Council of Governments will help local governments and watershed planning organizations develop 9-Element watershed plans for the Eno River, Knap of Reeds Creek, and Upper Barton Creek Watersheds. Once these plans are developed, practitioners in these areas will be eligible to obtain funding from the Section 319 Grant Program. The project will involve the following activities: 1) Use the 9 Element Checklist, developed by TJCOG and the NC Division of Water Resources (DWR), to determine if and where any of the plans for the Eno River, Knap of Reeds Creek, and Upper Barton Creek watersheds already meet the 9 Elements; 2) Develop additional elements in order to complete the 9 Element Checklist and submit them for approval to DWR; and 3) Work with local stakeholders to inform the process, make them aware of the revised EPA guidance and 9-Element Checklist, and assist them in identifying opportunities for collaboration, capacity building, and implementation. The Eastern Carolina Council (ECC) proposes to partner with the Town of Maysville, located in Jones County on the White Oak River, to map the Town’s existing stormwater infrastructure, evaluate the Town’s existing stormwater ordinances, and educate citizens of the Town on the importance of reducing stormwater pollution. The goals of this project are: 1) to help the Town better manage stormwater runoff for flood control, sediment and erosion control, and water quality, 2) to help improve water quality in the White Oak River Basin, and 3) to educate the public on how they can mitigate the impacts of stormwater runoff on water quality. This project involves completing the Eden Area Watershed Restoration Plan, begun in 2011. A Project Atlas appended to the plan will identify projects within priority subwatersheds that can most effectively serve the water quality needs of the Dan and/or Smith Rivers. The Plan will be revised to meet the needs of the US EPA’s Nine Key Elements of Local Watershed Planning as well as to assess how all recommended restoration efforts can also address the impacts of the coal ash spill and its legacy. This project will involve a robust outreach effort in the watershed that will work closely with stakeholder organizations to endorse or adopt the restoration plan and its recommended projects and programs. The Eastern Carolina Council (ECC) proposes to partner with the Town of Pine Knoll Shores, located in Carteret County on a barrier island between Bogue Sound and the Atlantic Ocean, to map the Town’s existing stormwater infrastructure, evaluate the Town’s existing stormwater ordinances, and educate citizens of the Town on the importance of reducing stormwater pollution. The goals of this project are: 1) to help the Town better manage stormwater runoff for flood control, sediment and erosion control, and water quality, 2) to help improve water quality in Bogue Sound and the Atlantic Ocean, and 3) to educate the public on how they can mitigate the impacts of stormwater runoff on water quality. Description: The council proposes to evaluate the town's stormwater ordinances and make recommendations for adjustments or additions to help improve water quality in the Neuse River Basin. The map of stormwater infrastructure will provide additional information for the Town of Oriental to assist them in addressing their stormwater and water quality issues. Description: The Southwestern Commission proposes to work with the Regional Erosion and Sediment Control Initiative to develop a consistent and affordable program to provide sediment and erosion control training to contractors in the seven western counties of North Carolina. Using a mountain-specific curriculum developed by the Eastern Band of Cherokee Indians in 2013, the Commission will develop a training delivery system, a marketing and certification program, a tracking system, and supplemental training materials, including two videos and two supplemental curricula. Update these eight plans where necessary in order to meet the EPA’s 9 Elements. Description: This project will develop low-impact development and traditional stormwater management scenarios for two different land uses and apply the new Stormwater Permit Application/Stormwater EZ tool to compare site-level stormwater characteristics of each scenario. Other components of this project to be funded through project partners would estimate expenditures and revenues on the part of local governments, developers, and tenants/landowners of designing, reviewing, permitting, constructing, and/or maintaining stormwater and stormwater-related infrastructure for the site. Land development stakeholders will be involved throughout the project. Description: The Albemarle Commission (AC), Albemarle Resource Conservation and Development Council and other project partners propose to develop a restoration plan for the Little River watershed using EPA’s nine-step process. The restoration plan will help guide efforts to conserve and restore the watershed, and identify key activities for future grant applications. The Little River watershed (Figure 1) was once rich in biodiversity with key anadromous fish and shellfish areas, and swamp forests critical to support native fish and wildlife, mitigate flooding, and protect water quality. Stormwater runoff from agriculture, and residential and commercial development in the watershed has degraded water quality to the point where a 7.9 mile section of the Little River is listed as Impaired (2012, 303d list). Description: An implementation guide for the Goose and Crooked Creek Watershed Management Plan. Implementation includes working with land owners identified in the Project Atlas, working towards adoption or acceptance by local jurisdictions and developing a long term management strategy. Description: Map the Town of Trent Wood's stormwater infrastructure, evaluate existing stormwater ordinances and educate the citizens on the importance of reducing stormwater pollution. This project will help the town to better manage stormwater, flood control, sediment and erosion control to improve water quality in the Trent River (Neuse River basin). Description: Conduct additional assessment in the Green River Watershed in order to: identify and prioritize stressors, evaluate and specify feasible water quality initiatives, and improve public involvement and interest in this relatively intact and high quality natural resource. Description: Ensure that elected officials in Region K better understand, communicate and are able to make informed decisions regarding water quality data, policies, practices, and regulations. This includes how to obtain state and local financial and regulatory commitments to implement those measures and to determine the nature, extent and cause of water quality problems in various areas of our region. An intensive public official education program will allow those officials to more fully understand the nature and extent of those programs, plans and monitoring activities. Without a better, clearer, understanding of the issues; the opportunities and constraints, communicated in layman’s terms, local involvement and proactive measures to protect and enhance water quality in rural areas will remain a tremendous challenge. The project will create a template to use in other rural areas. Description: Re-assess a GIS-based analyses of watershed conditions for protection and restoration planning purposes. 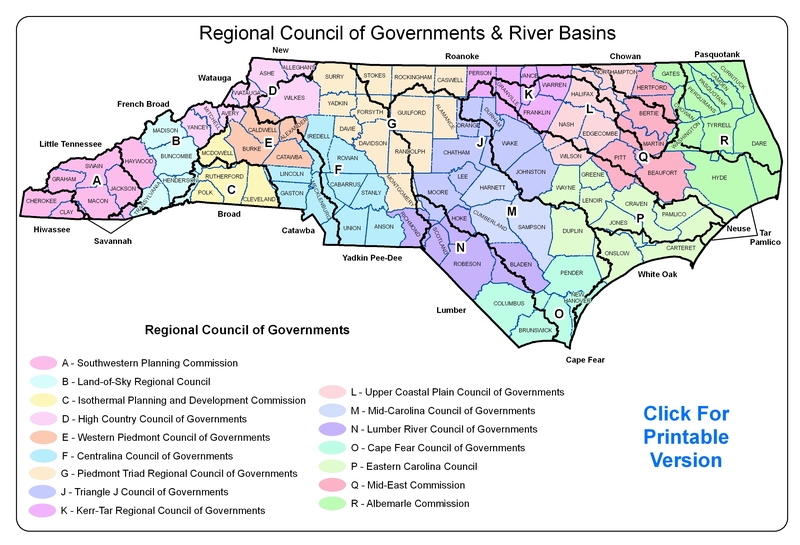 The original analysis anticipated water quality conditions at the 12-digit HUC scale based upon land use and land cover in all three of the PTRC river basins (Roanoke, Yadkin, and Cape Fear River Basins). While these assessments have predictive value in anticipating watersheds with good or poor water quality conditions, recent work on the Upper Cape Fear River basin has introduced a more nuanced analysis that is proving more valuable. The project will re-examine watershed prioritization throughout the Triad in the Yadkin-Pee Dee and Dan River Basins. Description: Design a wetland area(s) on the site of an existing golf course in order to improve the quality of the stormwater that drains into Fishing Creek, which is the home of at least two threatened/endangered aquatic species found in the subbasin. Description: To map the stormwater infrastructure for the Town of River Bend. Will help the town to better manage stormwater, flood control, sediment and erosion control to improve water quality in the Trent River (Neuse River basin). Description: To make site-specific plans and guidance for stormwater treatment best management practices and streambank restoration including the development of geodatabases critical to the effort. The plans will be for 19 towns in the COGs seven counties and include watersheds in the Catawba, French Broad, New, Watauga and Yadkin river basins. Description: To develop land use regulations to reduce pollution from stormwater runoff in the Black River watershed (Cape Fear River basin). Description: To collect environmental, economic and recreational data from North Carolina, Virginia and USEPA regional offices to identify restoration priorities in the Dan River sub-basin of the Roanoke River basin. A report and a website will be created as part of the project. Description: To provide support for Davidson County Citizens for Improving Stream Health (DC FISH) for outreach, education, the identification of groups to receive training for StreamWatch monitoring of impaired waterways and conduct stream clean-up events (Yadkin River basin). Description: To develop a long-term water quality monitoring program for the Upper Neuse River sub-basin (Neuse River Basin). Description: To collect environmental, economic and recreational data on the upper Cape Fear River basin to determine priority watersheds for restoration and conservation. A report and a website will be created as part of the project. Description: To produce a low-cost internal method for developing watershed action plans including identification of priorities, database resource updates, and the adaptation of an existing watershed plan (Catawba River basin).